Browsing through directories and disks is just point and click! Drives like the uIEC that can store gigabytes of software can be tedious and frustrating to navigate. 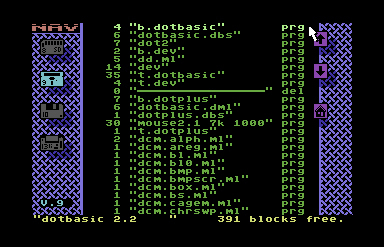 NAV lets you easily work with D64/D71/D81/DNP/M2I disk images as well as “real” Commodore disks and the IDE64. Up to five drives at a time! Just click a drive to browse it!Pressing the “@” key brings up a command line that acts just like the good ol’ DOS Wedge. In addition, there are a few additional commands that can be entered on the command line. Just type “@HELP” to get the complete list. My Action-Replay Fastload don`t work with this :( So i must stay by cbm-browse or sd2browse.